Welcome to the Chickasha Super 8 centrally located between Oklahoma City and Lawton with convenient access to I-44. Home of the Annual Festival of Lights held at Shannon Springs, beautiful and historic Chickasha has much to offer. Golfing, hiking, shopping, restaurants, museums, arts, antiques and more await you on your Grady County adventure. 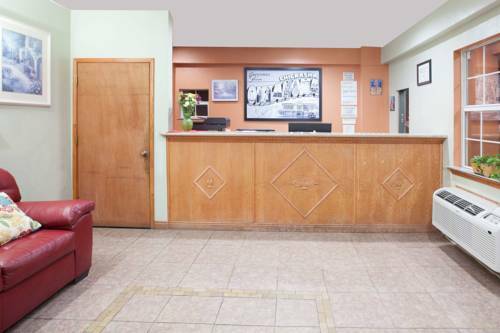 With complimentary wireless high speed internet, a SuperStart continental breakfast, 27 inch televisions, interior corridors and a relaxing outdoor pool, you can take in the Chickasha experience and feel right at home at our hotel. Enjoy Super 8, Chickasha and Grady County, the heartbeat of central Oklahoma. Star of TV's "Maverick" and "The Rockford Files" is honored in his home town. Garner also had a movie career, with stints in "The Great Escape" and "Victor Victoria." But here the cowboy is visualized. Sam and his beloved pooch, in bronze, are the entrance welcome statues outside a Walmart Supercenter. His scene in the movie "Twister" ended up on the cutting room floor. Now he beckons shoppers to a Western Wear store. Ironically blown to bits in 2011 storm; since repaired. The Guthrie Gunfighters, Oklahoman historical reenactors, blast each other on Saturday afternoons in the town streets.